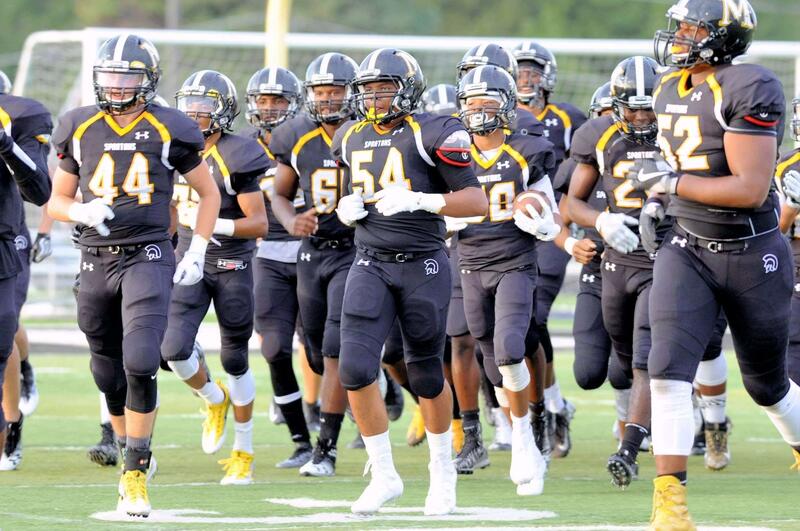 Our brand should be unique and easily identify Marian Catholic High School to the rest of the world. Used appropriately, typography, color and the elements within our brand represent the school in a clear and consistent manner. Consistency in our brand breeds recognition and awareness which is the first step to building brand equity in the school. This document is not an overhaul of our brand. Instead it is a standard to refine and unify our brand. These standards have been carefully and thoughtfully reviewed for many months by several members of our community. It is not perfect. It is a work in progress. Bringing all aspects of our school into uniformity will take time. The standards detailed below are intended to advance the mission and vision of Marian Catholic through clear and consistent communication. Please integrate these standards into your internal and external communications and apparel. Current materials should not be discarded. As new materials are needed, they should be created in uniformity with the standards below. How Will the Brand Guidelines Impact Me? Beginning immediately, ANYTHING intended to be used at, for, or by Marian Catholic must be reviewed and approved for brand compliance before it is purchased, worn or displayed. 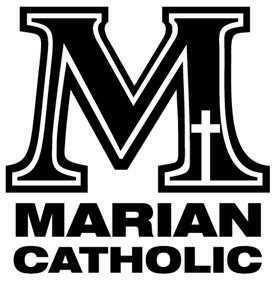 All Marian Catholic material must include a primary logo (see below) or “Marian Catholic” prominently displayed. Additional logos are allowed with prior approval. The Director of Marketing and Advertising will review samples of all written and electronic material. The Assistant Athletic Director will review samples of all apparel (Spirit Wear, uniforms, team gear). After their review, all materials must be approved by the Assistant Principal of Student Activities. After the Assistant Principal of Student Services approves the material, then the orders for your material may be placed. If an order is placed without the review and approval, the material will not be paid by Marian Catholic or from funds collected on behalf of any student. In addition, the material may not be distributed to the students, nor may it be worn or used at any school-related event. 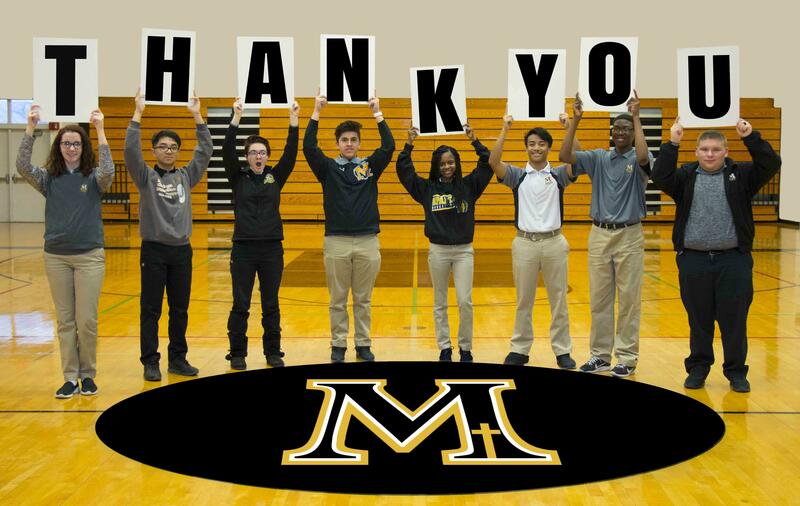 Marian Catholic will be the premier college preparatory high school in South Chicagoland and Northwest Indiana, educating students of the highest talent and character, providing them with boundless opportunities within a caring community, and empowering them to excel in college and beyond. 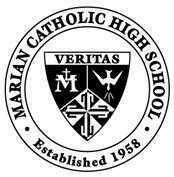 There is one official version of the Marian Catholic seal. It is typically used for official school uses such as contracts, stationery, podiums, ceremonial publications, formal invitations, and academic diplomas. It may also be used as a design element on clothing, athletic apparel, and publications. The seal may be black and white or black, white and metallic gold. The seal should not be black, white and yellow-gold. 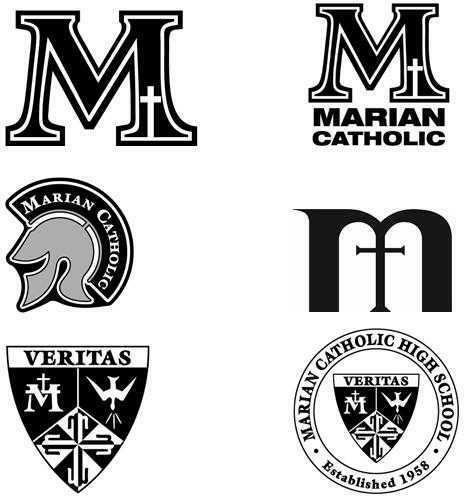 While other marks or logos exist for Marian Catholic and the Dominican order, the above PRIMARY LOGOs are the only approved LOGOS to be used in academic, administrative, athletic and fine arts Communications and apparel. 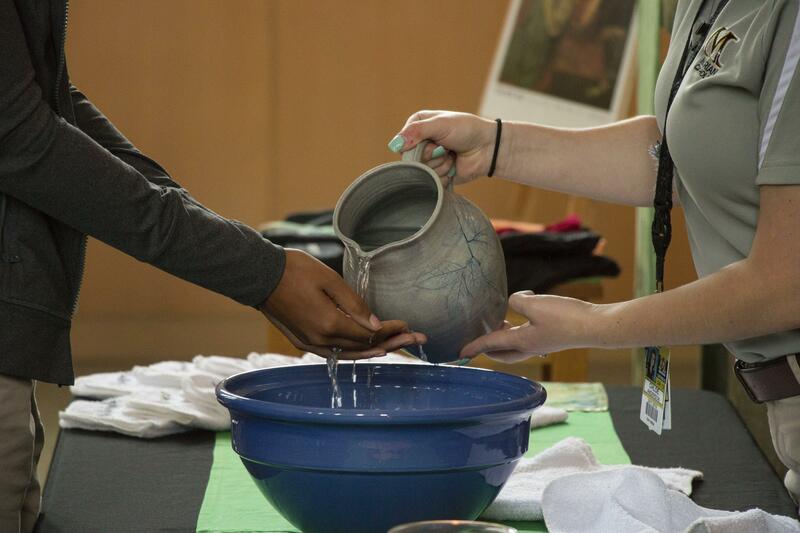 We are a Catholic institution. Therefore “Marian” should never be used alone. The preferred name is “Marian Catholic” or “Marian Catholic High School”. 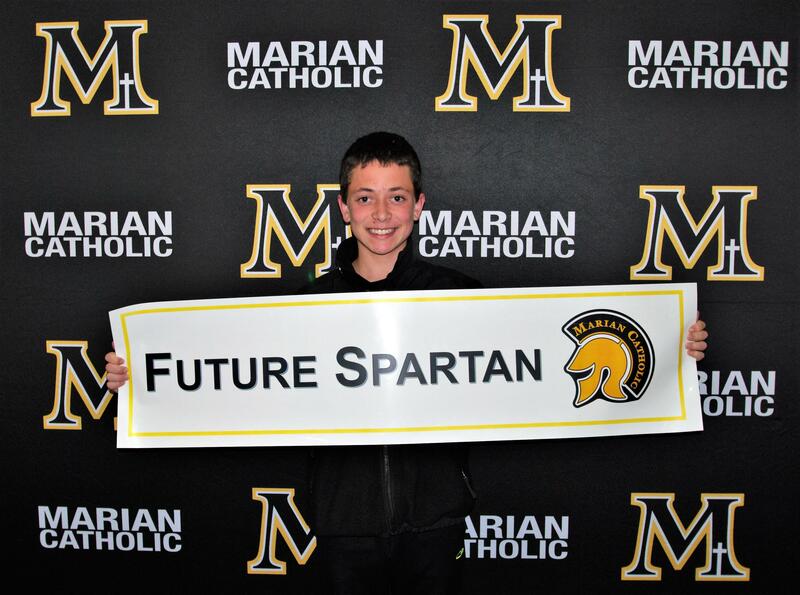 It is acceptable to use “Spartans” with “Marian Catholic”. In order to avoid confusion with other schools, the abbreviation “MC” should not be used. 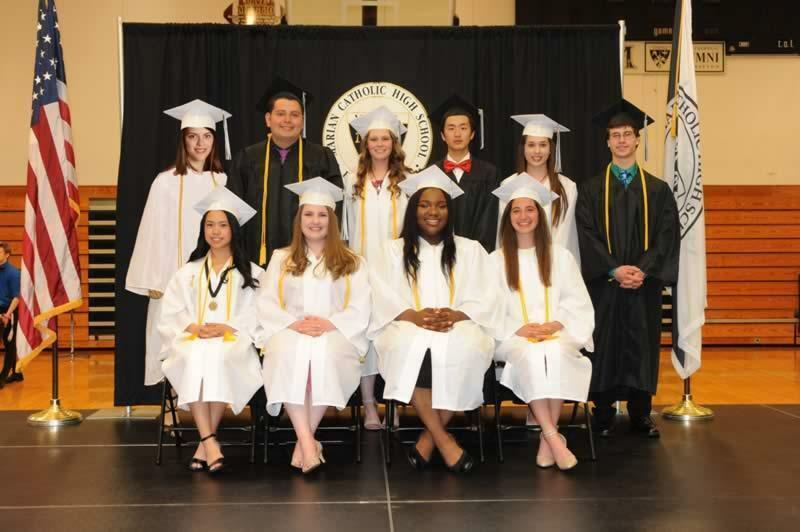 True to our Dominican heritage, the school colors are black and white. White represents the light piercing the darkness. Black reminds servants of God of their humility and obligation for penance. Gold was added “for a touch of excellence”. For many years “vegas gold” or ‘metallic gold” was used in certain situations. However, vegas gold is a very challenging color to replicate especially in apparel. 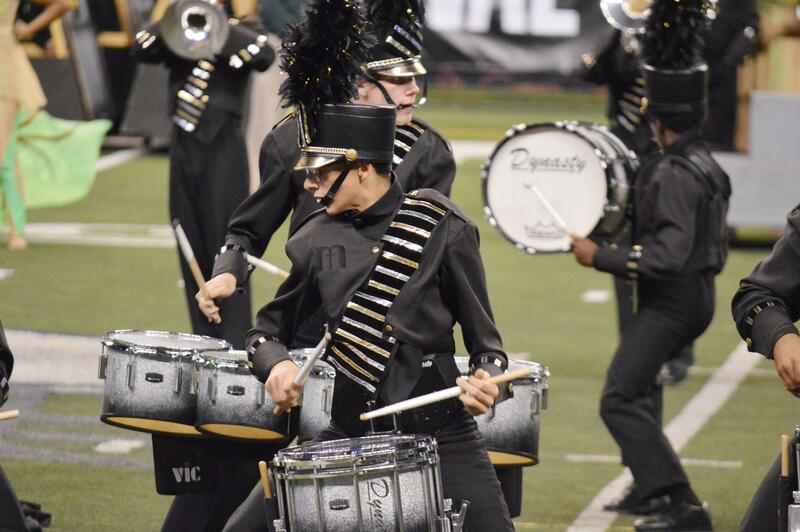 The primary colors for Marian Catholic High School are black and white. The accent color is a yellow gold (see below). All material (publications, uniforms and signs) should be primarily black and white but may include the yellow-gold accent. Gold leaf or metallic gold is allowed for official documents such as diplomas, the annual report, the Marian Annual Fund or with prior approval. Logo Art should not be modified in any way. 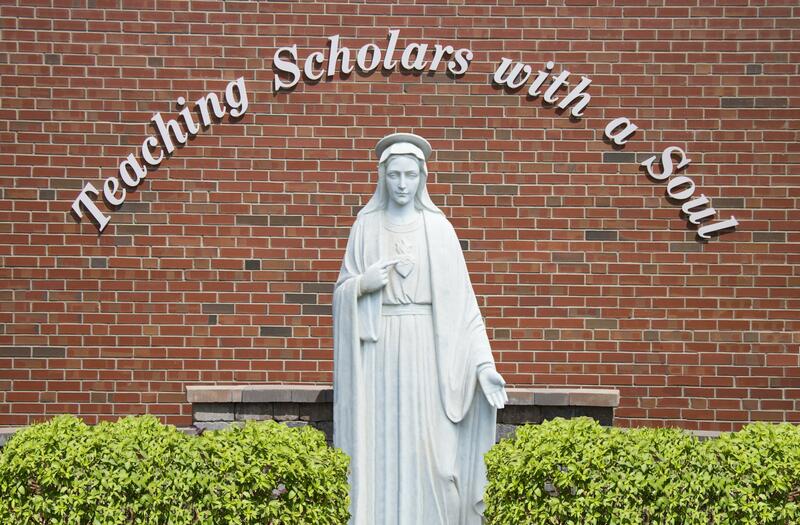 The colors, fonts, and type size proportions used are part of the Marian Catholic identity. Unless in a very controlled environment, and handled by a professional, colors will not always be consistent throughout the different media. The palates below have been chosen for their consistency and will help to standardize color from one medium to the next. Note: All commercial apparel and official school apparel, such as uniforms, should comply with the official school colors. There are three suggested fonts associated with the MCHS logos. Specific face and type size/proportions are listed below, as well as usage. Always use the Goudy or Helvetica Neue when possible. A list of similar PC fonts is included at the bottom for use when Goudy or Helvetica Neue is unavailable. NOTE: Goudy and Helvetica Neue are fonts available and used by professional printers and designers. They are purchased fonts, not bundled on a typical desktop system. Marian Catholic will purchase Goudy and Helvetica Neue for school use. Please contact Technology Department staff if you have questions about obtaining these fonts. The logo should always be reproduced at a size where it is clearly legible in the medium used; 5/8 inch is the minimum size for high-resolution printed materials. The visual identity is to be rendered larger than this minimum size when reproduced via low resolution media in order to maintain design integrity. The Marian Catholic High School seal should never appear smaller than 5/8 inch wide. Galliard should never be used when typesetting brochures, flyers, posters, etc, it functions as a display font for the crest only. Use a complementary font (Goudy, Helvetica Neue, PC) for typesetting needs. Specs: Small caps are 80-85% point size of Initial cap. Goudy is a serif font, looking best for more formal occasions. Recommended use is for print, where the regular italic, bold and bold italic faces would be appropriate. On the web, Goudy, like most serif fonts, becomes difficult to read. Web usage should be limited to large type in photo images only. Helvetica Neue is a sans serif font, excellent for print and web. Note that Helvetica Neue is NOT the same as Helvetica. The font was redrawn in the 1980’s specifically for digital uses, print and to correct inconsistencies and errors. The entire family (Helvetica Neue, Helvetica Neue Condensed and Helvetica Neue Extended) are used throughout. When Goudy and Helvetica Neue are unavailable, similar fonts found on a PC can be used instead. The listed substitutes can be bolded or italicized in most word processing programs. Please use the following only when printing simple projects from a desktop computer. Multiple choices are offered as each PC has slightly different font options. Fonts are listed in descending order of similarity. JPG (Joint Photographic Experts Group) used in Word and other MS Office programs or similar. File requests from desktop users for laser printing should be filled with logos from the .jpg directory. The JPG format is 150 dpi, exact color palette, may be sized smaller or larger, but should not exceed sizes 50% down or 50% up. 2-Color profile is “FFFF33” or Red 255 Green 255 Blue 51.